The Samyang 8mm f/3.5 Asph IF MC Fisheye CSII DH Lens features a detachable lens hood (DH), otherwise is the same (optically and mechanically) as the non detachable hood version. It is a high quality Fisheye type ultra wide angle lens aimed at digital SLRS / DSLRS with an APS-C size Cropped Sensor (CS). On Full frame cameras, it produces a vignetted image, which is almost circular with the lens hood detached. This effect is required for user wanting the biggest image / field of view for panoramic software on full frame cameras, and one of the reasons Samyang produced this removable lens hood version. 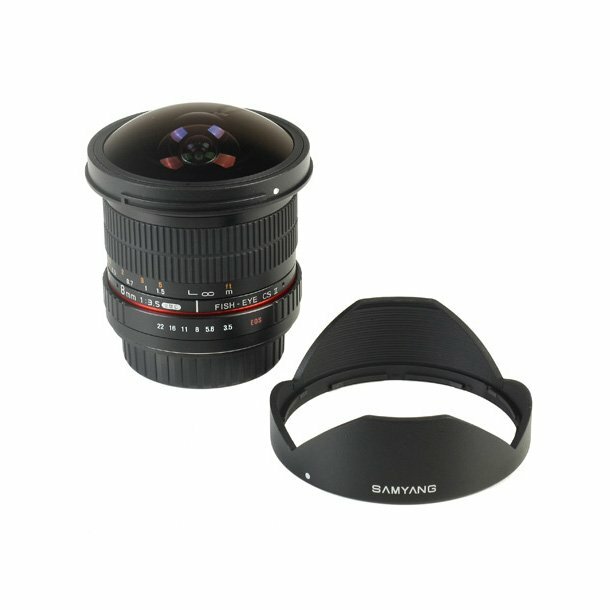 The Samyang 8 mm Fish-eye lens is ideal for creating panoramas and 360 virtual tours, including full 360 degree images with the correct hardware and various 3rd party panoramic software supplied by other vendors.